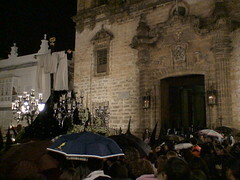 This entry was written by Alberto, posted on 15 de abril de 2006 at 5:24 pm, filed under Semana Santa 2006. Bookmark the permalink. Follow any comments here with the RSS feed for this post. Post a comment or leave a trackback: Trackback URL. NO TENIAN QUE HABER SALIDO. STO ENTIERRO NO SALIÃ“ … DESAMPARADOS CASI LE PILLA. TB HAN TENIDO MALA SUERTE….EN FIN.